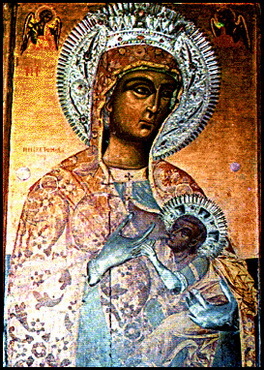 Eternal Orthodox Church calendar for the 16.07 year 2017. A young man, a courtier at the court of the Emperor Trajan, he was a secret Christian. Once, when the Emperor and all his court were offering sacrifice to idols, Hyacinthus stood apart from these abominable ceremonies. He was therefore denounced and brought to trial before the Emperor. The Emperor urged him to deny Christ and sacrifice to idols, but Hyacinthus remained firm as diamond and said to the Emperor: "I am a Christian. I revere Christ and worship Him, and I bring my living self to Him as a sacrifice." Whipped, spat upon and flayed, this holy martyr was flung into prison. By order of the Emperor, he was given nothing to eat but food that had been sacrificed to idols. Hyacinthus would not eat this, and died in prison after eight days. 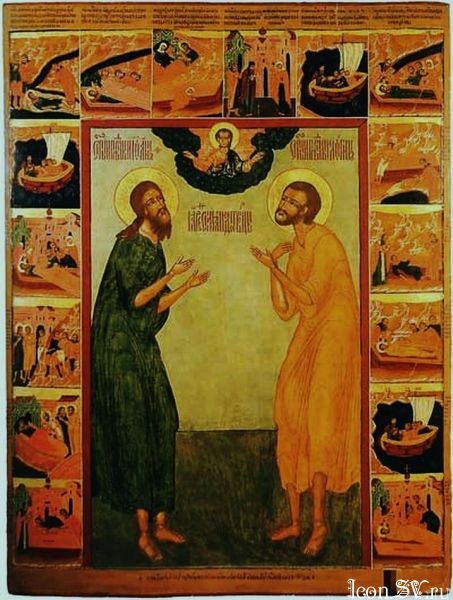 The warder saw two shining angels in the prison, one covering the martyr"s body with his own glorious vesture and the other placing a wreath of glory on his head; and the whole prison was filled with light and radiance. The young Hyacinthus suffered with honour and was crowned with a wreath of glory in the year 108. 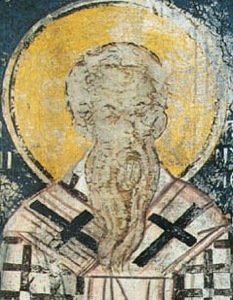 Born in Asia and educated in Constantinople, he went into the army after completing his studies and became an officer. Reading the Holy Scriptures, he came upon the Saviour"s words: "If thou wilt be perfect, go and sell all that thou hast, and give to the poor, and thou shalt have treasure in heaven; and come and follow Me" (Matt. 19:21).These words made such an impression on him that he sold and gave away all that he had, and went off to the desert. 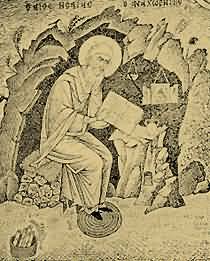 After long asceticism and striving for purification, he founded the community of the "Wakeful Ones" (Acoemetae) with a special rule. According to this rule, the services in the church continued day and night in unbroken sequence. The brethren were divided into six groups, each having its appointed hours of day or night to go to church and take over the reading and singing from the previous group. He travelled a great deal all over the East, bringing people to faith in Christ, disputing with heretics, working miracles by God"s grace and growing old in the service of the Lord Jesus. 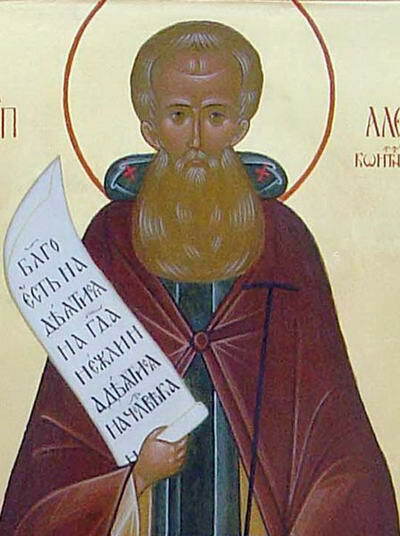 He finished his earthly course in Constantinople in the year 430, where his relics revealed the miraculous power and glory with which God had glorified His holy servant. 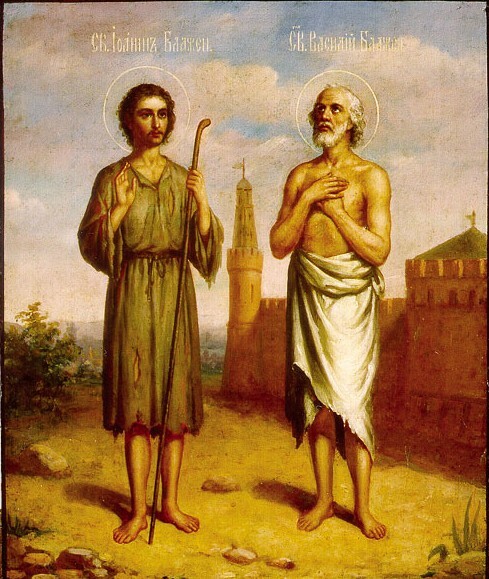 He lived in asceticism at Scetis in Egypt and then in Palestine, dying in Gaza in about 491. 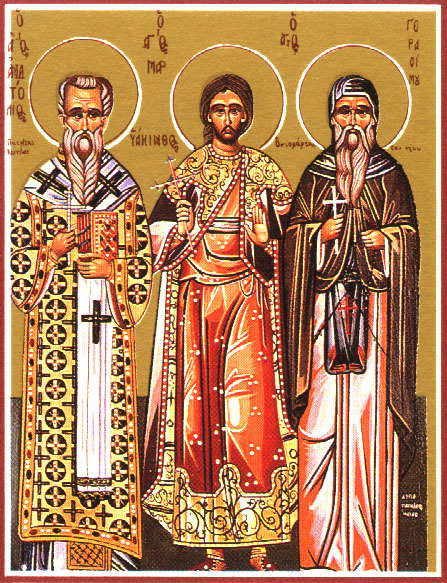 He is mentioned in Barsanuphius and John"s book as a man of outstanding holiness (Answers: 240, 252, 311 etc.). He wrote much that was instructive for monks and solitaries, but few of his writings are extant, the majority having been destroyed by Moslems. 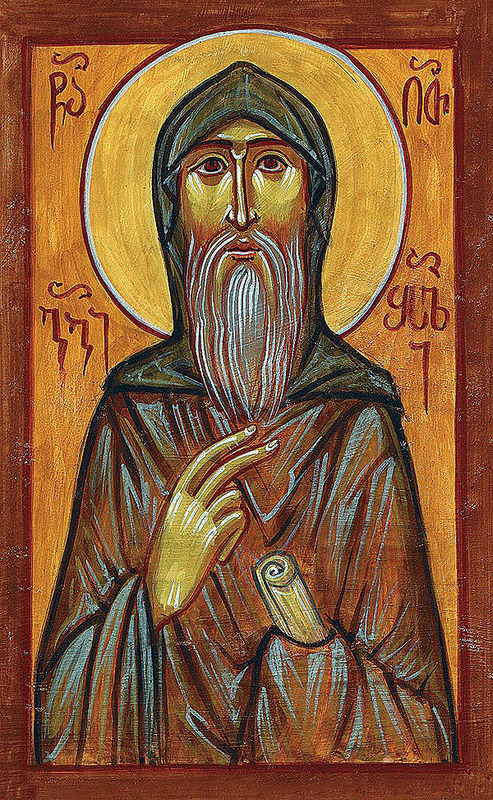 St Isaiah said: "The mind, before it awakens from the sleep of laziness, is with the demons." "The crown of all good works consists in this: that a man place all his hope in God, that he flee to Him once and for all with all his heart and strength, that he be filled with compassion for all and weep before God, imploring His help and mercy." What is the sign that a man"s sin is forgiven? "The sign that a sin is forgiven is that the sin has no further action in your heart, and that you have so utterly forgotten it that, in speaking of such a sin, you feel no inclination to it but regard it as something totally outside you. That is the sign that you are forgiven." Prayer and asceticism are useless to a man who conceals within himself malice towards his neighbour and the desire for revenge. "Watch with all your strength that your mouth does not speak one thing and your heart contain something quite different." "The crown of good works is love; the crown of the passions is the justifying of one"s sins. 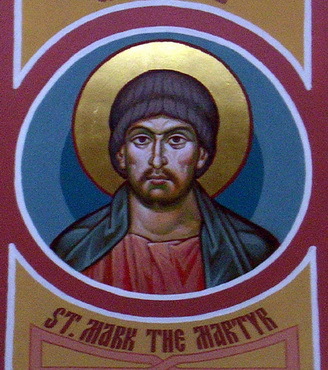 The Holy Martyrs Mokios and Mark were arrested as Christians and brought to trial by the governor Maximian. They refused to offer sacrifice to idols, for which they suffered death by beheading by the sword (IV Century). 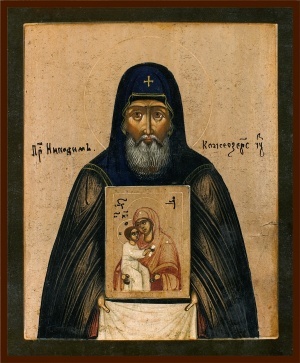 Blessed John, Fool-for-Christ, Moscow Wonderworker, was born in the Vologda outskirts. In his youth he toiled at a saltworks, where he was a "water-carrier". With his heavy work the saint combined strict fasting and prayer. Later he moved on to Rostov, where he began his exploit of holy fool. He wore chains with heavy iron crosses and on his head was an heavy iron cap, for which they called him "Ioann – Big-Cap". In Moscow he went barefoot and almost naked in even the most severe frost, and he foretold the great misfortunes for Russia, the Time of Troubles and the incursion of the Polish, saying, that "in Moscow will be many seen and unseen devils". He fearlessly spoke the truth to everyone, regardless of the position they might occupy. Even to the tsar himself, Boris Godunov, he often said the words: "A clever mind, thou inquirest God's doing. God long waiteth, painfully indeed it breaketh". 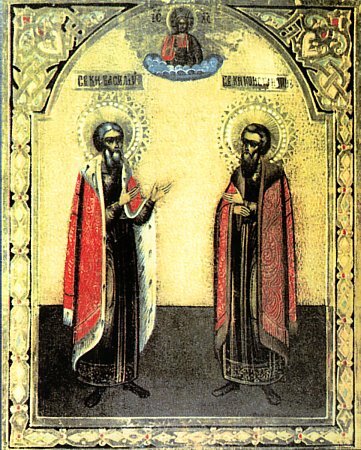 Before death Saint John indicated for himself a grave at the Pokrov church on Rva, afterwards called the cathedral of Basil/Vasilii the Great. Having readied himself for the grave, he removed the chains and thrice showered himself with water. Before his death (+ 1589) the blessed one displayed the gift of healing. 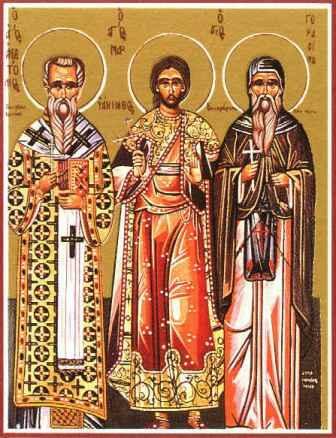 He was venerated at Moscow as a great wonderworker and seer. On 12 June 1672 his relics were uncovered, resting beneathe a crypt in one of the chapels of the cathedral of Basil the Great. The service and vita-life were preserved in manuscripts of the XVII Century.